We’re used to seeing a variety of vehicles traveling our trail—bikes, trikes, recumbents, horses, strollers, dog trailers—but a canoe? Chris and Luz are from Virginia, and their September trip along the Little Miami was their second along the river. On their first trip, in October 2008, they loaded a moped onto their mini-van’s rear rack to use as a shuttle, and packed their Dahon folding bikes inside the van for the drive to Ohio. The canoe trip down the river involved extra trips between the apartment they rented near the trail and the put-in and take-out points on the river using the moped and van, as the moped couldn’t be used on our trail. They did take a short bike ride on the trail, but it was separate from the canoe ride. There had to be a better way to enjoy both the river and the trail. 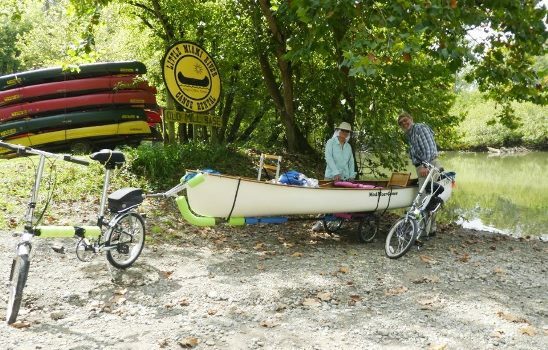 Their bike ride inspired Chris to make a canoe trailer that could be pulled by the folding bikes, thus eliminating the trip to drop off or pick up the mini-van. 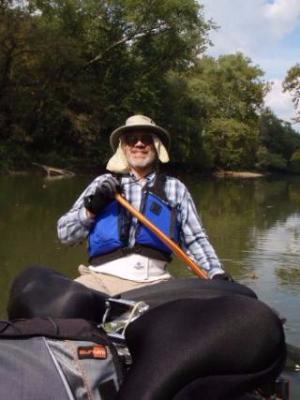 After finding that most existing commercial bike carts were designed to pull smaller kayaks, Chris customized a canoe cart he had purchased at Costco more than a decade ago. With the help of a racing go-cart shop, Chris made two custom trailer tongues—one for the bike, one for the moped. He added additional support on the folding bike’s rear rack so he could add a trailer hitch. At the risk of sounding like a mind-bending logic problem, let’s see how it all works. 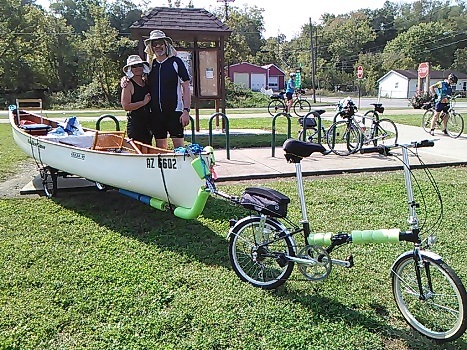 Chris and Luz drive from Virginia in their mini-van, toting a 16-foot canoe, a cart and tongue, and two folding bikes. On the morning of their adventure, they attach the tongue to the cart, load the canoe onto the trailer, and hitch it to Chris’s bike. They ride up the trail on their bikes to their put-in point at South Lebanon. This is where Don Hahn meets them on the trail, intrigued with the setup, and watches as they prepare for their trip down the river. Don also had the presence of mind to snap some photos. Chris detaches the tongue from the cart and loads it in the canoe. 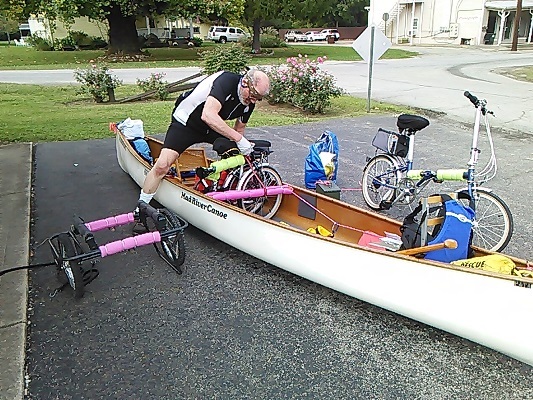 He then folds the bikes and put them in the canoe (second photo). They roll the cart with the loaded canoe to the river’s edge, slip the canoe off the cart, and finally load the cart into the canoe. Then it’s time to float down the river and relax. Later, at the take-out point, they pile everything on and into the van to return to their hotel. It was hot the week they visited the Little Miami, and the river level was a bit low, but that’s to be expected when canoeing in the fall. “The only complaint I would have about the Little Miami River Bike and Water trail,” reports Chris, “is that in some locations the bike trail and boat launching areas are on opposite sides of the river, like in South Lebanon.” Probably those planning these areas did not foresee the clever conveyance of the Haggertys. Besides that, they enjoyed their trip. We wish Chris and Luz many more happy adventures on bike and water trails, and we hope to see their canoe on our Little Miami trail again soon.